Diesel fuel is naturally unstable. Its quality and chemistry are impacted by transportation and storage from refinery to user, by heat and pressure of engines, pumps and injectors and by water and microbial contaminates. 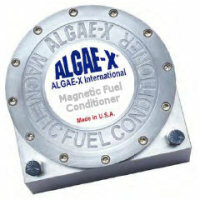 ALGAE-X™ fuel conditioning improves fuel quality by reducing the size and mass of fuel droplets, organic deposits on filters and sludge in tanks. Fuel optimization enhances combustion, extends equipment life and lowers operating cost. 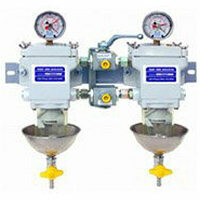 SEPAR 2000™ is a water and fuel separator designed to accommodate newer and more demanding diesel engines. In marine use, the SEPAR 2000 series protects your engine form harmful impurities. The SEPAR 2000 brand of filters are manufactured from high quality non corroding aluminum alloy casting, heavy polycarbonate or metal bowls and stainless steel hardware. Single and Duplex systems are available from 80 GPH to 2060 GPH. The Duplex switch assemblies allow element replacement while the engine is running.